Architectural photographer and archivist Laura Rosen's Top of the City introduced readers to an unseen world high above the streets of New York City. In the entrancing photographs of this volume, taken over a period of three years, in all kinds of weather, she leads us on a journey along the overlooked edges of Manhattan. Even jaded New Yorkers would be taken aback by the aesthetic vision of these 140 duotone images, which can make aging and derelict structures seem somehow heroic. Accompanied by Rosen's wryly affectionate, deeply knowledgeable text, this is a book that reveals New York City's past, present, and even its future in brilliant, timeless images. Anyone who has read Laura Rosen's first book, Top of the City: New York's Hidden Rooftop World, should already be lining up for this one. An architectural photographer of precision and reserve, Rosen also happens to be a stylish writer with an uncanny gift for bringing New York City stones to life. Manhattan Shores is evocative of Paul Goldberger's classic The City Observed in that it is a book about Gotham that puts wings on your feet. You'll want to read it, coordinate your subway and bus maps, or hop on a Circle Line boat, and travel around the edge of the island. 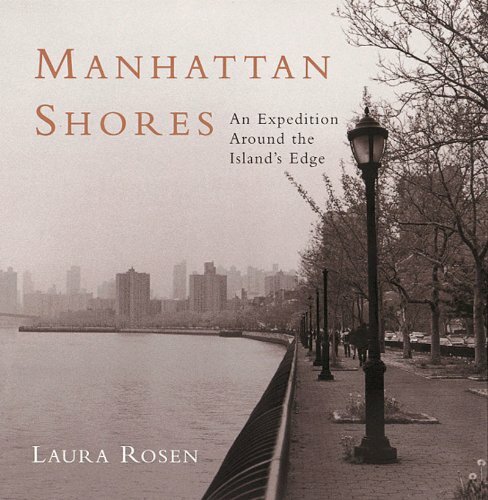 From the Bronx to the Battery, Rosen covers the waterfront. Her black-and-white pictures are crystalline and composed, with only a ripple of "human interest" content. The most personal picture is of a white pit bull, posing sphinxlike, on a patch of grass under a "Dog Free Lawn" sign. The rest of the images, from a shot of a lone fisherman on the Battery Park City esplanade to the nosecones of two fighter planes facing off on the deck of the USS Intrepid, have a dignity that borders on grandeur. Rosen often employs a studied symmetry that can make even a quartet of lampposts at the end of East 37th Street seem as impressive and durable as a redwood forest. There is nothing of the snapshot here.